24 October 2016, Singapore – Panasonic Factory Solutions Asia Pacific (PFSAP) adopts sustainable power generation with Sunseap Group Pte Ltd (Sunseap), one of the largest sustainable energy provider in South East Asia Pacific, under a 25-year Solar Power Purchase Agreement (PPA). The collaboration sees the installation of 3,476 pieces of Panasonic HIT®2 294Wp solar panels on the roof areas, across three factory buildings at its premise located at Jalan Ahmad Ibrahim. 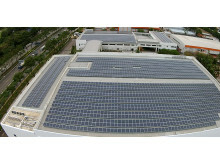 This is the second solar project undertaken with Sunseap in Singapore, after a successful implementation at Panasonic Appliances Refrigeration Devices Singapore (PAPRDSG) last year. The roll-out was completed in September and enables PFSAP to generate approximately 1,193,631 kilowatt-hour (kWh) of solar energy annually, based on its 1.022 MegaWatt-peak (MWp) solar system. At its peak, the factory’s photovoltaic (PV) system is expected to power, on average, close to 20% of its entire energy consumption. As one of the highest module efficiency in the market, Panasonic’s solar panelHIT®2 is an example of energy generation through effective use of limited space. Unlike conventional solar panels, HIT®2 can maintain high performance at high temperature, making them ideal for utilisation in tropical climates. The panels are manufactured at Panasonic Energy Malaysia Sdn. Bhd., located at Kulim Hi-Tech Park, Kedah, Malaysia. The PV system generates annual electricity power equivalent to electricity produced by approximately 1,253,313 pounds of coal, 83,554 gallons of oil. Through Sunseap’s Solar PPA, PFSAP is able to save 515 tons of CO2, equivalent to planting 13,200 trees and reduce the factories’1 contribution to harmful air pollution. This desirable outcome of the new installation is aligned with Panasonic’s target of reducing 700,000 tonnes of carbon emissions by 2016 through green manufacturing practices. 22. HIT is a registered trademark of the Panasonic Group in Japan. Panasonic Asia Pacific provides the whole range of the brand’s products and solutions across the Southeast Asia and Oceania (APAC) region, covering 27 countries including 10 offices in Australia, Cambodia, Indonesia, Malaysia, Myanmar, New Zealand, Philippines, Singapore, Thailand and Vietnam. Panasonic Factory Solutions Asia Pacific (PFSAP), a registered business of Panasonic Asia Pacific Pte. Ltd., is a total solutions provider, delivering innovative solutions that strongly add value to its customer production and process, thereby enhancing customers’ throughput and production. PFSAP has manufactured Auto Insertion (AI) machines in-house since 1989. Over the years, PFSAP has added Surface Mount Technology (SMT) machines and Microelectronics machines to its product range. More recently from 2011, PFSAP acquired the manufacturing capabilities to develop Microelectronics machines in-house through technological transfer from Panasonic Factory Solutions Co., Ltd. in Japan. In 2013, PFSAP ventured into new business of premium agriculture products through high-technology indoor farming solutions. For more information about PFSAP, please visit www.pfsap.panasonic.com.sg. 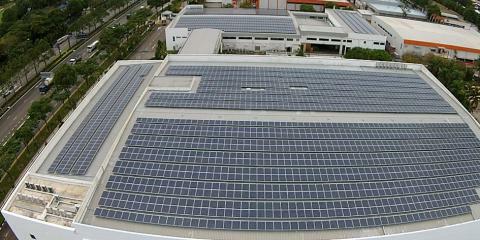 Sunseap Group is the leading clean energy provider in Singapore. It operates through 3 key units; Sunseap Leasing, Sunseap International and Sunseap Energy. Sunseap Leasing is the first and largest company in Singapore to specialize in Solar Power Purchase Agreement (PPA). Sunseap International targets markets in the South East Asian and Pacific regions to ride on the global growth in adoption of Solar Energy. Sunseap Energy provides clean energy solutions utilizing off-site arrangements by drawing on solar systems within the Group’s portfolio of distributed generation assets. Visit www.sunseap.com to find out more.